For the many of the millions dealing with specific types of excessive sweating such as palmar or plantar hyperhidrosis, finding a treatment option like iontophoresis can be a relief. The use of iontophoresis devices has increased as more people suffering from hyperhidrosis are searching for new excessive sweating treatment options. It makes sense when the number of people who fail to get relief from standard treatments like prescription-strength antiperspirants. The iontophoresis device works by using water to conduct a low electric current through the surface of the skin. It remains largely a mystery why iontophoresis devices function as an excessive sweating treatment, but physicians suggest that the trace minerals found in the water and the electrical charge act together to cause a microscopic thickening of the outer skin tissue. By thickening the skin, the flow of sweat to the surface is impeded. Once the outpour of sweat is interrupted, sweat production to the palms and feet may stop completely. During the process of iontophoresis, electricity is applied to the patient’s hands, feet, or both, when they are immersed in shallow trays. They must spend at least 20 to 40 minutes soaking in the trays while an attached iontophoresis device sends an electric current through the water. Iontophoresis treatments are repeated until the sweating is lowered to comfortable levels. Afterwards, the patient must continue treatments periodically to maintain the level of dryness desired. Often, the type of water used can affect the results of iontophoresis. Factors like geography, mineral make-up, levels of electrolytes, or whether soft water is being used can influence the quality of this excessive sweating treatment. 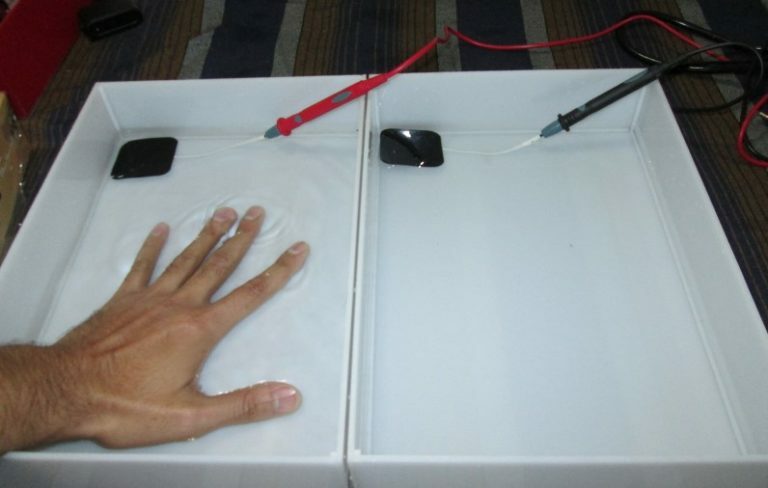 Doctors may add elements to the water to make iontophoresis device treatments work better. The attending physician may add baking soda or opt for using prescription strength medicines like anticholinergics. There are certain people who should not use iontophoresis device as an excessive sweating treatment. For example, pregnant women, people who have cardiac conditions, epilepsy, metallic implants such as hip or joint replacements, and those who have pacemakers. Also, metal jewelry should be removed before undergoing iontophoresis. Some common concerns voiced by people interested in pursuing iontophoresis as a viable treatment option for their excessive sweating include the risks for electric shock and serious skin irritations that can occur. A serious concern is really unnecessary. With excessive dryness or irritation of the skin, most of the time a basic moisturizer will do the trick. You doctor may even suggest the use of Vaseline or other barriers to protect more sensitive places. With an electric shock, it is enough to say that the level of current used in iontophoresis devices is far much lower to cause any damage. Since control of the hyperhidrosis is the ultimate goal, you need to know whether iontophoresis will provide the best treatment option; the best way to do this is by talking to a skin expert. You should find out if iontophoresis is the best excessive sweating treatment for your situation. Just as one should know excessive sweating can decrease a sufferer’s quality of life, making them feel at a loss of control. Their sweating becomes a condition that can occur even when their body does not require any temperature regulation. Because the sufferers know that they may start sweating at any time, they get nervous and anxious easily. This behavior usually aggravates their sweating problem further. Iontophoresis devices, therefore, remains to be the best mediator to sufferer’s wellness.